Last year, a group of scientists made an incredible discovery — they spotted an animal who wasn’t quite a dolphin and who wasn’t quite whale, but looked like both animals mixed together. It turned out to be a rare hybrid. 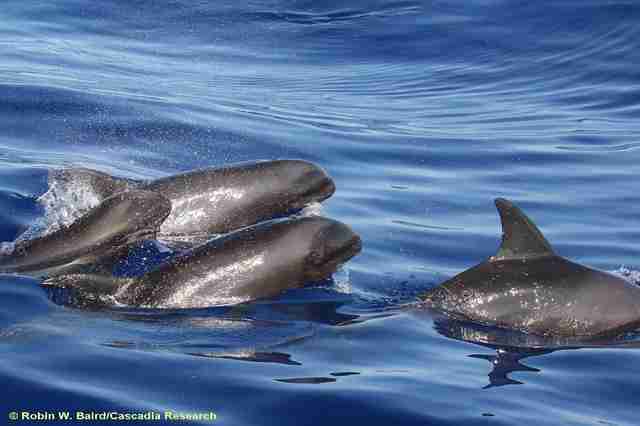 The scientists, who are part of Cascadia Research Collective, had been tagging rough-toothed dolphins and melon-headed whales off the coast of Kauai, Hawaii, when they encountered the strange-looking animal, who was swimming alongside a melon-headed whale. Eager to figure out what this animal was, they used a humane method to obtain a skin biopsy sample, and then got it tested in the lab. 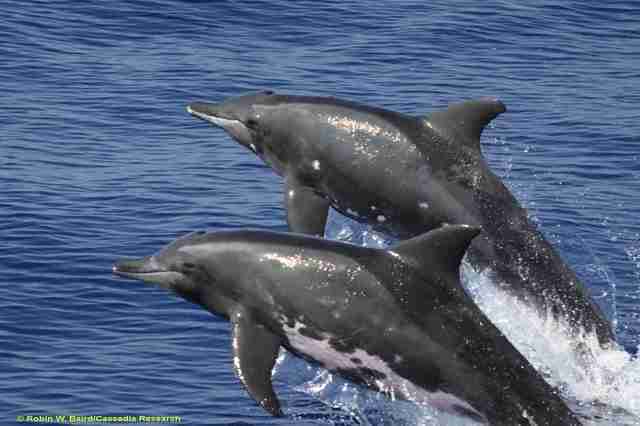 Despite their name, melon-headed whales belong to the dolphin family, but they are colloquially referred to as whales. However, melon-headed whales are still a very different kind of animal from rough-tooth dolphins, and this is the first time scientists have ever encountered a hybrid between a rough-toothed dolphin and a melon-headed whale. However, other hybrids have been discovered before — for instance, fin whales and blue whales have bred together to create rare hybrids. From the genetic testing, the scientists also figured out that the hybrid’s father was a rough-toothed dolphin and the mom was a melon-headed whale — and they suspected that the melon-headed whale swimming alongside the hybrid was the mother herself. While this discovery doesn’t mean that a new species is forming, Baird and the other scientists are excited that this animal exists. “It’s certainly of interest from the perspective of understanding the frequency of how the hybridization can occur among species, including two species that are not closely related,” Baird said. 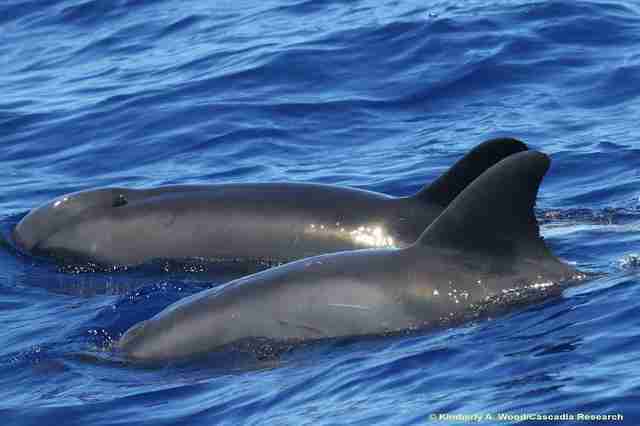 Right now, the scientists only have a couple of photos of the hybrid whale-dolphin, but they’re hoping to obtain more in the future. 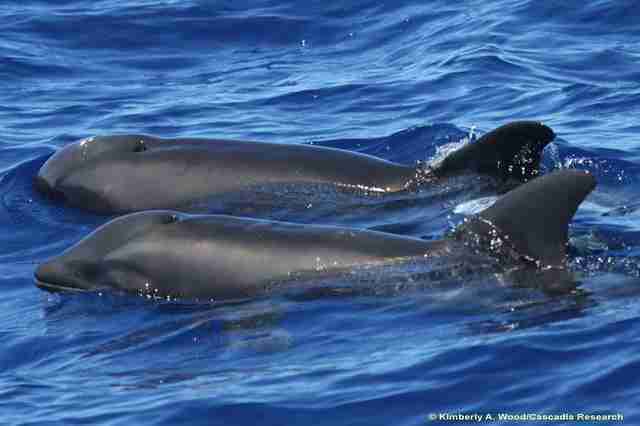 If you happen to see this hybrid dolphin-whale in Hawaii, please take photos and send them to hawaii@cascadiaresearch.org.